It is possible to respond to the challenges of the global market and do business in a changing world, drawing on the strength of a quality product and increasingly qualified know-how. 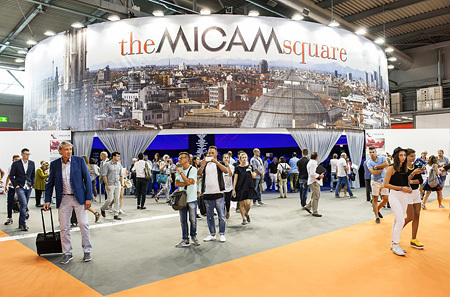 This is the premise of the 82nd edition of theMICAM, the key event in the footwear industry world-wide, coming up at Fiera Milano (Rho) September 3 through 6, 2016. More than 1,400 enterprises will attend this key event on the trade fair calendar, which attracts a lot of interest among dealers, not only because it offers a sneak preview of the new collections, but above all because it is the most reliable thermometer of the market and of one of the most important sectors of Italian industry, directly employing more than 77 thousand people in almost 5 thousand companies. This year the vast, highly qualified range of participating companies will include Missoni, Pollini, F.lli Borgioli and Gattinoni, historic Italian fashion brands. The exhibition area will include a new “Luxury” sector alongside a product design area, the International Designers Area; an area with a special focus on “Contemporary” style; an “iKids” area showcasing children's footwear featuring “iKIDS Square”, and lastly, the “Active” and “Cosmopolitan” areas for leisure footwear. The 82nd theMicam will feature screening of a short film, “Niente per caso”, by Consorzio Vero Cuoio Italiano, the association of Italian leather enterprises. This short fashion movie pays homage to the Italian fashion system, looking back over half a century of Italian fashion with a focus on footwear, a fantastic voyage through fascinating, mysterious places featuring extraordinary characters who talk about themselves in different languages and dress with Italian style. This special project features Caterina Murino, a successful Italian actress who is the epitome of elegance. TRENDS theMICAM is more fashionable and glamorous than ever. The spring/summer 2017 collection will be eclectic: a mix of urban grit and romantic folk creating unique looks contaminated by the exotic flavour of the many different cultures of the world's biggest cities, creating a glamorous look to show off on the beach by day or out on the town at night. ECLECTIC WAVE – WOMEN Comfort is back, in homage to Armani's wardrobe of the ’80s, when forms became more structured. The genre is unisex, and the style brings together a variety of genres including punk, new romanticism and activewear. Materials and details are influenced by the styles of the ’80s, with metallic leather inserts giving them a futuristic look. Neoprene and elastic materials are essential in athletic shoes. The mirror effect appears in sandals and sneakers. Colours are influenced by the looks and inspiration of the digital age, with references to the ’80s; the summer abounds in electric colours. ECLECTIC WAVE – MEN Prints and graphics are combined with abstract and geometric patterns for high impact fabrics evoking the digital age. Printed leather, digital graphics and sporty motifs are the keys to the materials in this trend. Laces and decorative tears are inspired by athletic style. Prints and relief patterns appear in sneakers. Plenty of bright colours, such as bright red, sea green and yellow, contrasting with duller colours like dark black or ice white.. ROMANTIC GRIT – WOMEN In our age of ever-expanding cities, the suburbs offer a new source of creative inspiration. A blend of urban grit and romantic folk makes Romantic Grit perfect for casual shoes. Built around contrasting opposites, the style is crudely realistic but preserves a cosy family feel and shows appreciation for the beauty of nature. Patchwork graphics feature hand stitching. Floral embroidery on lightweight fabrics. Leather, worked and aged with floral prints, completes the look. Pastel hues, neutral colours and earthy spring tones, from an orange that blends into antique rose to contrasting grey and green. ROMANTIC GRIT – MEN Far removed from the chaos of today's big cities, Romantic Grit explores a style emerging on the boundaries of the city, characterised by gritty suburbs and homey folklore. Aged, faded leather is perfect for this rural style. Canvas in neutral hues appear alongside suede and worked leather. Velcro and stretch materials are combined in a sporty style. Pastel hues, neutral colours and earthy spring hues, from grey to white, contrasting with yellow and green. EXOTIC FRINGE – WOMEN Summer looks are inspired by Cuba and the Caribbean. Tropical flowers and rope inspired by the jungle give footwear a casual look. A glamorous look for the beach that blurs the boundaries between looks for day and night. Tropical leaves are printed on electric colours. Fringes and raw leather are the key elements in sandal buckles. Strong, rich, bright colours, blues and reds, purplish magenta sequins with hints of blue, green and mustard yellow. EXOTIC FRINGE – MEN Tropical landscapes and long summer evenings provide the backdrop for casual footwear, including a beach style recalling the great city of Havana with a dive into the past. Natural cotton and lightweight leather are the key materials in these shoes. Laser-cut and worked leather contribute a tailored style. Soles made of natural rope are the must-have in both athletic and elegant styles in the Exotic Fringe trend. The colour palette includes a balance of neutral hues and bright colours. LUXE TECH – WOMEN In search of comfort and elegance, technology plays a key role in fabrics and materials, with metallic elements adding important little details. Elastic materials in relief, quilted fabrics in a single colour to add volume, shapes in relief on shoes. Metal and suede trim are the distinguishing features of uppers. Colours range from metallic green to powder pink and burgundy, along with hues of grey. LUXE TECH – MEN Balanced and calm: this is the Luxe Tech attitude taking us through the end of summer into fall. A more elegant tone appears in athletic shoes inspired by a practical, sophisticated look. High-tech openwork fabrics are perfect for casual shoes. Elegant suede and lightweight leather are the key materials for uppers. Darker hues feature occasional bright metallic highlights.